I have all the caps to replace them in my National NC-2-40D receiver and I am hoping someone can tell me how to go about removing the catacomb carriage located on the bottom of the unit. It seems I read somewhere that a spreader was needed to remove this unit, can anyone verify this or offer suggestion to me to make this job easier? You don't need to remove the catacomb. Just crank it over to one side, do the caps showing, then crank it over to the other side and do the rest. Unless you know for certain there are bad caps inside the catacomb, I'd definitely leave it alone. Also make sure the new caps lie close to the chassie, so when the catacombs slides back and forth they don't rub. Although it is quite true you don't need to remove the catacomb, it does make working on the radio LOTS easier. The process is quite simple. 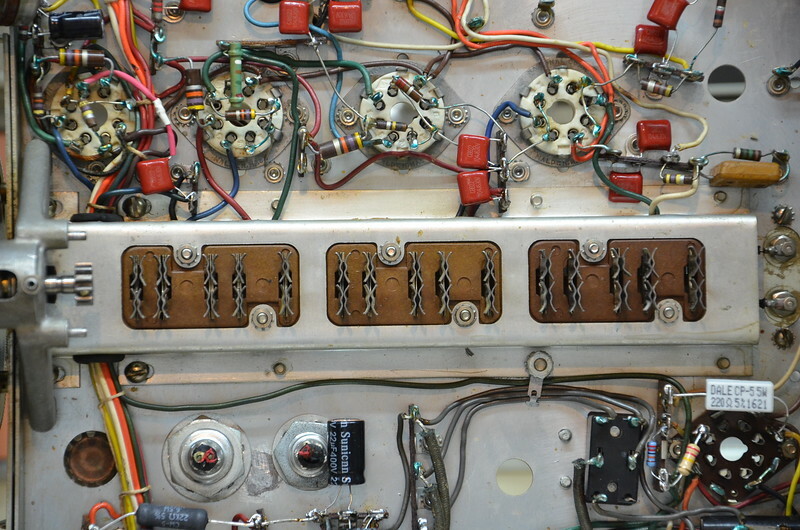 Each of the bands have 3 modules that connect to the radio via the connector under the casting. 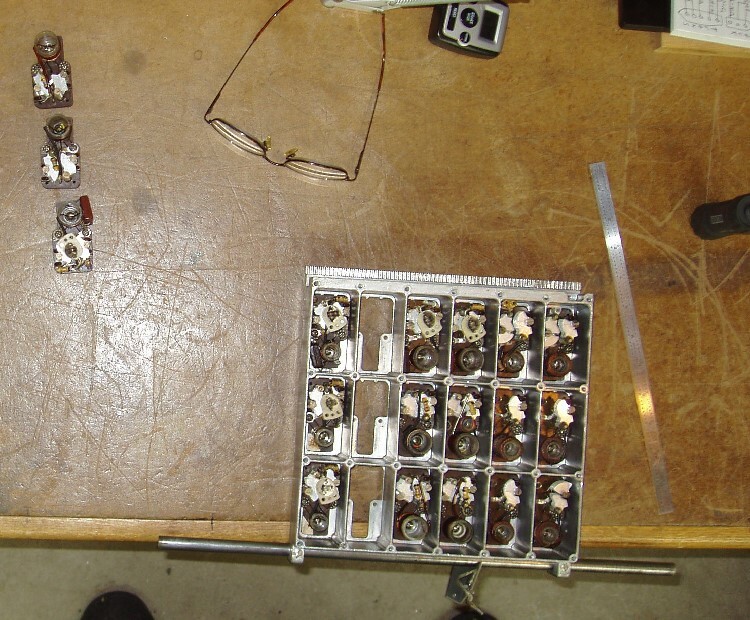 Simply remove one of the "center" bands modules, move the catacomb so the "empty band" is over the connector fingers, and take it out. The Catacomb is held in place at the rear of the chassis by the rod going from side to side. The rod is mounted with a single screw in each end, and a center bracket. FIRST and very IMPORTANT, pull the band change/tuning knob to the "OUT" position. Remove the rod end mounting screws and the two screws holding the center bracket, hook your index finger under each end of the rod. Smartly lift one end, then the other. The ends will snap over the dimples in the chassis. The rear of the catacomb can now be lifted and pulled toward the rear of the chassis and easily removed. The BIG connector is undoubtedly pretty dirty so now is a great time to use some good cleaner, and cotton swabs, and clean the fingers well. They may also be somewhat splayed so some adjustment might be in order. Don't forget the pins on the modules, I did some gentle burnishing of the pins with some fine steel wool. Then some contact cleaner SPARINGLY applied with a Q-tip or cotton swab, to each of the pins before re-installing the catacomb. Mike thank you so much for the information and pictures of your experience with the 2-40D. These will be the perfect aid to help me with this project. I think the radio has two major issued beside the need to be recapped. I know the main tuning knob is in need of a good cleaning as well as the fingers. It seems when the tuning knob places the catacomb in the resting place for a certain band the noise is really muted until you turn the knob a bit past the center detente in either direction. This leads me to believe that as the pen slides in between the finger that is cleans the outer parts of the fingers as it enters them. That might explain why if the tuning knob is rocked a little past center in either direction I can obtain a signal. Have done a couple, a NC-200 and a NC-100X both were very dirty and one had a broken contacts. Well worth the effort to get it all cleaned up and making good reliable connections. Would hurt to checkout the bushing have had one of them get loose. It's pressed into the catacomb. Think I need to peen it or something. Makes the bandswitch bind. Having to rock the casting past the detent is THE indication that the switch/pins are dirty. Once clean you won't have any of that. You'll find out just how dirty when it comes time to clean them. That process will most likely take better than an hour. In the pic you see most of the sets of fingers are "closed" but others are "open" or somewhat spaced apart. Those open sets have to be adjusted so they are closed. Cleaning you'll need to get Q-tips or cotton swabs down into the area where the pin sets when making contact. Incidently I happened to find a pic which shows how the catacomb "empty band" should be aligned with the contacts in the receiver when installing or removing the catacomb. Not too clear, but you get the idea. I'll also upload some pics of the mechanical "cable routing" for the "band" indicator. 1. I did mine without removing the catacomb, and it can be done. Whether you do it that way or Mike's way, however, the key is to thoroughly clean the pins and fingers. It improves performance considerably. No more wiggling the bandswitch knob to get a band to engage. 2. When adjusting the open fingers, as Mike suggests, make sure they still line up straight after the adjustment. When changing bands, the catacomb and fingers come through with significant force and you don't want to mangle any of the fingers. 3. On Mike's pictures, note the small caps he used. That's a great idea because the catacomb has to slide above the caps. 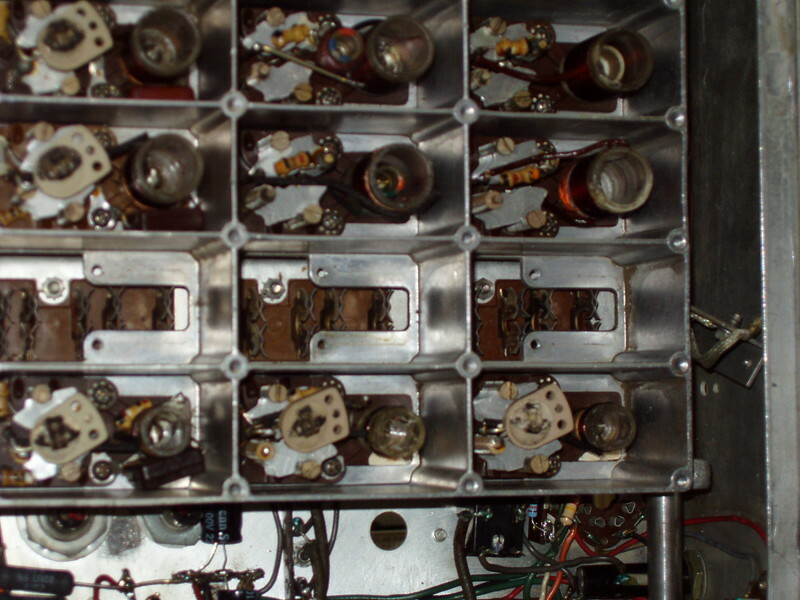 You'll also note that (in addition to the very neat workmanship), Mike replaced some resistors. In these sets, a fair number of the resistors seem to drift high. 4. These are tremendous receivers and well worth the time and effort to do things right. how are the fingers adjusted if they have a large gap? The fingers fit somewhat loosely in the block, and I pushed an Exacto blade between the two contacts pressing down into the block, to hold things steady there, and then alternately pressed the two contacts against one another. Thanks again Mike that make sense and I should be able to follow this example. Yes, although that particular picture shows only the area around the band switch, all the Cs and Rs, are in place, with one exception. At the extreme right edge of the pic, just above the band switch, there is one "original" micamold cap left. I didn't notice it, and I couldn't get the R.F. Amp coils to peak, and, sensitivity was pretty bad. I finally found the problem, and it was THAT cap, the cold end bypass cap for the input tank circuits. Replaced it, and the gain went up about 10-15 db. hanks Mike I am almost done then it appears and the radio sounds so much better. I was able to clean the pins and the contacts with some good cleaner and now I don't have to rock the band position knob in between detentes to get it to come in. I want to thank you again Mike for the pictures and advise. You're welcome, glad I could help. Enjoy your new receiver. Mike, let me say thank you too. I have an NC-101X that I am restoring, as well as another airlines receiver in the same category. Your guidance on removing the coils before pulling the catacomb is timely and valuable advice. Also your description and photos showing how to properly align the contacts are much appreciated. Considering no replacement parts are available, trial and error methods could be less than satisfactory. 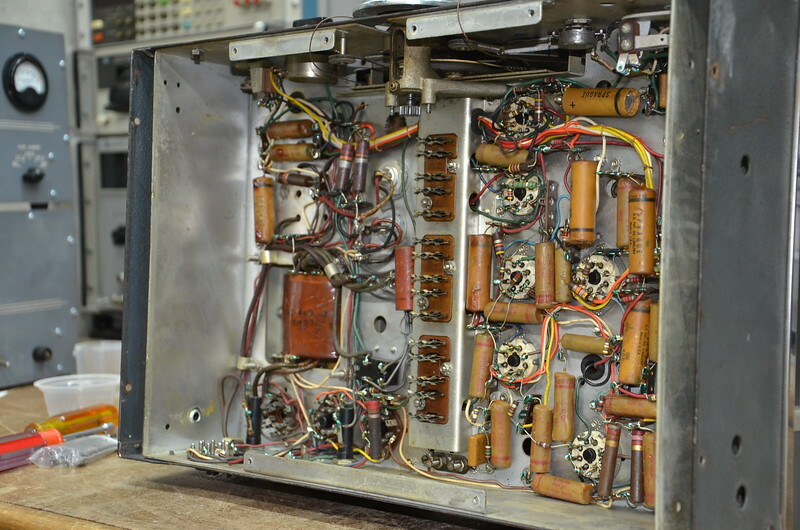 Modereators: Perhaps this thread could be preserved in the restoration section of this forum? Yes, I am earmarking this thread for the NC-2-40CS that is next in line on my work bench for restoration. Around 89 or 90, I ran across at an old farmhouse yard sale, a 'C' variant of this receiver (not the CS) that included a Hallicrafters PM23 speaker mated to it (with the letter H no less on lower left of grill). It had a couple issues at the time that I corrected but to this day it has not been restored, even so, it worked very well. I hadn't used it much last couple of years but last year after turning it on, I was not able to change bands as the rack has somehow seized. I stopped myself real quick on that, didn't want to be breaking something that can't be repaired. Even the control knobs have gotten very stiff in turning. And since it hasn't been restored, I think I better wait on turning it back on again until I've had a chance to restore it. Don't want to be taking out the power transformer either. I too will be making note of this thread for future reference.